"Setting up an air purifier spy camera inside our mother's room provided us a sense of peace." We can't keep an eye on her at all times but the camera can. 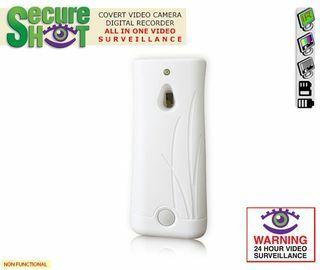 We are certain that placing hidden cameras in nursing home grounds could safeguard our loved ones. This is a Great Long Term Surveillance Product with NightVision, PIR Motion Activation. and 1 Year Battery. 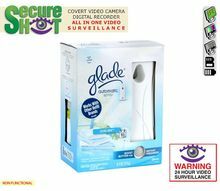 This unique covert system is housed in a common brand (Glade) portable timed spray type air freshener housing. (Non functional) Totally battery operated by a long life Li-ion rechargeable/removable battery which powers unit for 1 full year of standby power or 40 hours of actual motion activated video recording! Video recording quality is Full High Definition 1080P Resolution. User program options include lower recording rate if required for up to 160 hours recording on a 32Gb SD card. Best of all, and internal array of high power (950 nm) TOTALLY invisible (NO GLOW) micro IR illuminators are specially designed via our exclusive "variable frequency strobe circuit" to penetrate the case itself, making the entire unit an invisible IR light source capable of recording an entire room (up to 20 feet) in TOTAL DARKNESS! SD card is hidden inside the case, and requires a special secret procedure to open. Included IR remote control allows for user programming and arming and disarming system. VLF player software disc, and 4Gb SD card.